Here’s a bracelet that’s on sale at J Crew for $49.99 in-store (long sku 099103172662). I’m not sure if it was ever online. It looked so much like the crystal compilation bracelet, but I knew it was different. It’s different than the crystal comp and without such a honking big stone, it’s easier to wear. Plus, sparkle always does my spirit good. Here’s the newer bracelet at the top of the pic. The crystal compilation is below it. Very identical. The main middle stone of the top bracelet is inset and much smaller. The crystal comp has a big main stone in a raised setting, surrounded by other smaller pretties. Side-by-side on my wrist. A pain to clasp by myself. I need one more circle jump on the bracelets. 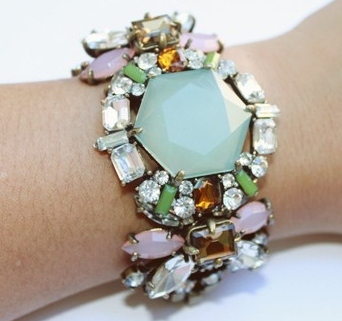 Groopdealz – inspired crystal compilation bracelet ($10.99) is available as of 9/16. The vendor on this one is IMAccessories. The vendor on my crystal comp purchased from Groopdealz is A Lovely You. Looks identical to the one above. I’m convinced these knockoff houses are sourcing the same production facilities. And I wouldn’t be surprised if some of them are changing their names. I’ve seen that on Ebay where a seller will sell under one name. Disappear and sell under another. I’m guessed that’s the case because the sellers ran identical ads. My J Crew retail crystal comp vs my Groopdealz crystal comp. The very heart of your writing while appearing agreeable initially, did not work properly with me personally after some time. Somewhere within the sentences you were able to make me a believer unfortunately just for a while. I however have got a problem with your jumps in assumptions and one would do nicely to help fill in those gaps. In the event you actually can accomplish that, I will surely end up being fascinated. Needed to draft you that little note to be able to thank you so much over again for your personal marvelous principles you’ve shared here. It is really incredibly open-handed of you to grant publicly what exactly numerous people would’ve offered for an electronic book to help with making some profit for their own end, especially considering that you could have done it in the event you considered necessary. These good ideas also worked to become great way to be aware that the rest have the identical passion the same as my own to know whole lot more on the subject of this condition. I know there are several more enjoyable periods up front for folks who find out your site. You must take component in a contest for one of the very best blogs on the internet. I will advise this internet site! Very efficiently written post. It will be valuable to everyone who employess it, including myself. Keep up the good work – for sure i will check out more posts. I simply want to say I’m beginner to weblog and actually enjoyed your website. Almost certainly I’m want to bookmark your site . You absolutely come with great posts. With thanks for sharing with us your web-site. I simply want to mention I’m new to blogs and definitely enjoyed this web page. Probably I’m going to bookmark your blog . You surely have excellent articles. Bless you for revealing your blog. I simply want to mention I’m very new to blogs and absolutely loved you’re blog. Probably I’m planning to bookmark your blog . You definitely have amazing stories. Thanks for sharing your web page. I simply want to mention I am just newbie to weblog and seriously enjoyed you’re website. Most likely I’m planning to bookmark your website . You actually have impressive stories. Regards for sharing with us your website. I simply want to say I am new to blogging and site-building and actually enjoyed you’re blog. More than likely I’m want to bookmark your blog . You actually come with fabulous writings. Thanks a bunch for sharing your web-site. I simply want to say I am just new to weblog and really savored your page. More than likely I’m likely to bookmark your blog . You definitely come with really good stories. Bless you for sharing with us your website. I just want to tell you that I am newbie to blogs and absolutely enjoyed your page. Probably I’m want to bookmark your site . You definitely have fabulous well written articles. Kudos for revealing your website page. I simply want to say I am just all new to weblog and really liked this web site. More than likely I’m going to bookmark your blog post . You absolutely have fabulous writings. Regards for sharing with us your webpage. I just want to say I am just newbie to blogging and site-building and definitely loved your web page. Probably I’m going to bookmark your blog post . You actually come with awesome stories. Many thanks for sharing your blog site. I just like the valuable information you supply for your articles. I’ll bookmark your weblog and take a look at once more right here frequently. I am relatively sure I will be informed lots of new stuff proper right here! Good luck for the following! Hey there, You have done a great job. I will definitely digg it and personally suggest to my friends. I am confident they’ll be benefited from this site. I just want to say I am just very new to blogging and site-building and seriously loved your web site. Very likely I’m planning to bookmark your site . You amazingly come with superb well written articles. With thanks for sharing your web site. I just want to tell you that I’m beginner to weblog and actually liked your blog site. More than likely I’m going to bookmark your blog post . You actually come with tremendous stories. Kudos for revealing your web site. Great post. I was checking continuously this blog and I’m impressed! Very helpful information specifically the last part 🙂 I care for such info a lot. I was looking for this certain information for a long time. Thank you and best of luck. Howdy! This article couldn’t be written any better! Reading through this post reminds me of my previous roommate! He continually kept preaching about this. I’ll forward this article to him. Pretty sure he’s going to have a good read. Thanks for sharing! This is a great tip particularly to those new to the blogosphere. Short but very accurate info… Thank you for sharing this one. A must read post! magnificent points altogether, you just gained a brand new reader. What may you suggest about your post that you made some days ago? Any positive? Can I simply say what a relief to find somebody who truly knows what they are talking about online. You certainly know how to bring an issue to light and make it important. More people need to check this out and understand this side of your story. I was surprised that you are not more popular because you definitely possess the gift. Thank you for some other informative site. The place else may I get that type of info written in such an ideal method? I’ve a undertaking that I am simply now working on, and I have been at the look out for such info. Definitely, what a fantastic website and educative posts, I definitely will bookmark your blog.Have an awsome day! What i do not understood is in fact how you’re not really much more smartly-preferred than you may be now. You’re so intelligent. You understand thus considerably in terms of this matter, made me individually consider it from numerous numerous angles. Its like men and women aren’t fascinated until it’s one thing to accomplish with Woman gaga! Your personal stuffs nice. Always handle it up! I’ve been surfing online greater than three hours lately, yet I never found any interesting article like yours. It¡¦s beautiful value sufficient for me. In my opinion, if all webmasters and bloggers made excellent content as you probably did, the web will probably be much more useful than ever before. Thank you a bunch for sharing this with all people you really recognise what you are talking about! Bookmarked. Kindly also visit my website =). We could have a hyperlink exchange contract among us! Hi! I simply would like to give you a big thumbs up for the excellent information you’ve got right here on this post. I’ll be coming back to your web site for more soon. Thanks , I have just been looking for info approximately this topic for a long time and yours is the best I have discovered till now. However, what about the bottom line? Are you positive in regards to the supply? Your style is unique in comparison to other people I have read stuff from. Thanks for posting when you’ve got the opportunity, Guess I will just bookmark this site. An outstanding share! I’ve just forwarded this onto a co-worker who was conducting a little research on this. And he in fact bought me lunch simply because I found it for him… lol. So allow me to reword this…. Thanks for the meal!! But yeah, thanx for spending time to discuss this topic here on your blog. Hi there! I could have sworn I’ve been to your blog before but after looking at a few of the articles I realized it’s new to me. Anyhow, I’m certainly happy I discovered it and I’ll be book-marking it and checking back often! Great website. A lot of helpful information here. I am sending it to several friends ans also sharing in delicious. And of course, thank you for your effort! Hey very cool site!! Man .. Beautiful .. Superb .. I will bookmark your website and take the feeds also¡KI am satisfied to seek out a lot of useful info right here within the submit, we’d like develop extra strategies in this regard, thank you for sharing. . . . . . Thanks for every other informative web site. The place else may just I get that type of information written in such a perfect manner? I’ve a challenge that I am simply now running on, and I have been on the look out for such information.